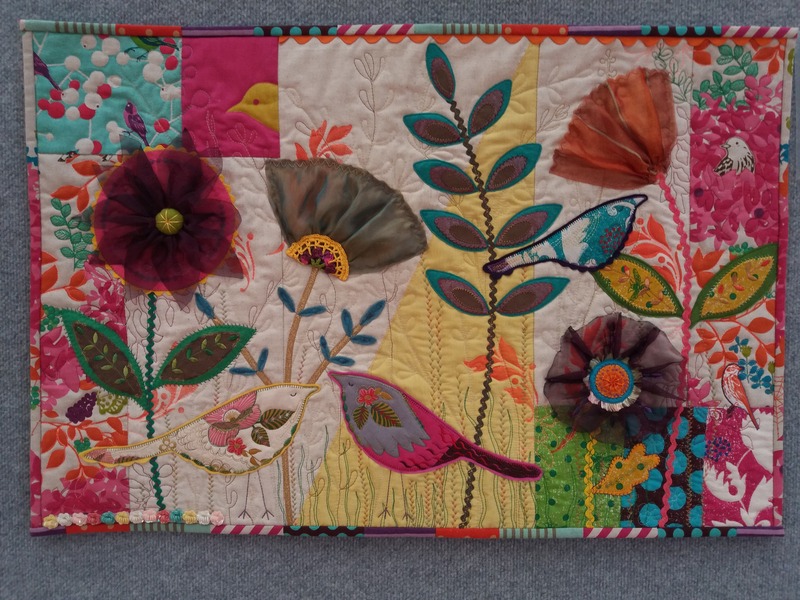 Freedom was the challenge word for the Dorothy Collard Challenge for the Auckland Quilt Guild in 2016. I’ve been enjoying embroidering on felt with the sewing machine so my mind turned to applique/birds and then on to the passage from Mathew 6: 26 about how the birds of the air don’t have to worry about clothing or food and that is one form of Freedom. So from there is pulled out my ‘bird’ fabric, which wasn’t much and then decided to just have fun with different applique techniques/chiffon flowers/machine embroidery and quilting. Here is the finished result: Unfortunately not a prize winner but I did sell it to a lady from the USA so it is now in her collection. This entry was posted in Exhibitions & Competitions, Mary Metcalf. Bookmark the permalink. I love this quilt. We can’t always win a competition but this a winner in itself. Congratulations. Thanks. Pleased you liked it!